WHAT'S YOUR DESIGN STYLE? Are you drawn to a particular style of design such as Modern, Cabin Chic, Traditional or maybe Beach/Coastal, Industrial, or Farmhouse? Or do you find yourself somewhere in-between? Does it matter, you ask. Good question. We think so. By having a general idea of your style (which can change over time) you will have an easier time searching for and conveying to others the surroundings in which you feel most comfortable. 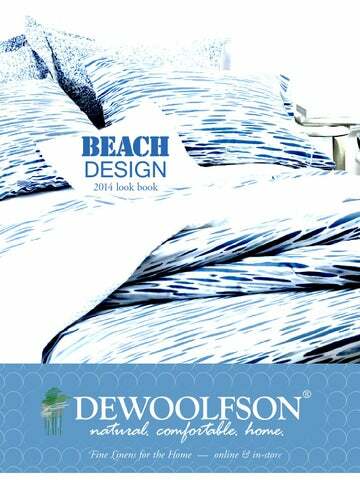 We created this Beach/Coastal guide to give you a sneak-peek of the latest styles our designers have to offer for those most comfortable in a beach setting and to show you what we think coordinates well together, combining pieces from a number of our designers. This is our first design style ideas look book. We hope it's helpful and inspiring in your quest for living beautifully and harmoniously with your soul. Live, Love & Laugh Beautifully. natural. comfortable. home. DE WOOL FSON L I N E NS 9 452 N C H i g h w a y 10 5 S . B a n n e r E l k , N C 2 8 6 0 4 U. S . A . © 2 014 DE WO OL FSON D OW N I N T ’ L ., I NC.